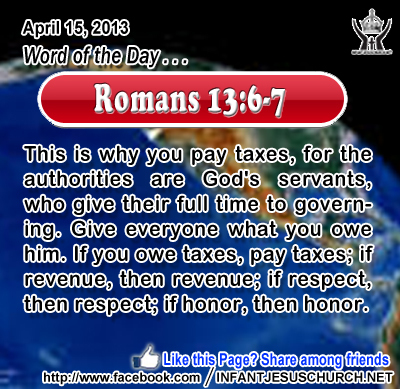 Romans 13:6-7: This is why you pay taxes, for the authorities are God's servants, who give their full time to governing. Give everyone what you owe him. If you owe taxes, pay taxes; if revenue, then revenue; if respect, then respect; if honor, then honor. Heavenly Father, we thank you that we are free in you and belong to no one and no power. Yet since we want your name to be respected, we will obey the laws of this land according to your will. At the same time, O Lord, we passionately pray that you will heal our land and bring our hearts back to you. In Infant Jesus' name we pray. Amen. 22On the next day the people who remained on the other side of the sea saw that there had been only one boat there, and that Jesus had not entered the boat with his disciples, but that his disciples had gone away alone. 23 However, boats from Tiber'i-as came near the place where they ate the bread after the Lord had given thanks. 24 So when the people saw that Jesus was not there, nor his disciples, they themselves got into the boats and went to Caper'na-um, seeking Jesus. 25 When they found him on the other side of the sea, they said to him, "Rabbi, when did you come here?" 26 Jesus answered them, "Truly, truly, I say to you, you seek me, not because you saw signs, but because you ate your fill of the loaves. 27 Do not labor for the food which perishes, but for the food which endures to eternal life, which the Son of man will give to you; for on him has God the Father set his seal." 28 Then they said to him, "What must we do, to be doing the works of God?" 29 Jesus answered them, "This is the work of God, that you believe in him whom he has sent." Jesus spoke about the works of God and what we must do to be doing the works of God, namely to believe in God's Son whom he has sent into the world. Jesus offers a new association with God which issues in a new type of life: A life of love and service, and the forgiveness of others which communicates to God's mercy and kindness; a life of holiness and wholesomeness which corresponds to God's holiness; and a life of obedience and trust which corresponds to the wisdom of God. This is the work which Jesus directs us to and enables us to execute in the power of the Holy Spirit. Do we hunger for the bread which comes down from heaven and thirst for the words of everlasting life? Loving Infant Jesus, you alone can satisfy the deepest longing and desire in our hearts. May we always hunger for the imperishable bread, that we may be satisfied in you alone as the True Bread of Heaven. Nurture and strengthen us that we may serve you with great joy, generosity, and zeal all the days of my life.